The 1997 Custom Harley Fatboy for sale is a 1997 Harley Davidson Fatboy FLSTF that has tons of extras, upgrades and motorcycle accessories added onto it including a 96" (EVO) Evolution Motor. The FLSTF currently has only 44,829 Miles on it AND it has a Performance Machine Phatail kit with a 240 size rear tire. There are some very tasteful add-ons including wheels, handlebars, headlight, seat and upgraded exhaust just to name a few. If you have any questions regarding the beautifully customized Fat Boy for sale or if you would like to make an appointment to see it in person or make payment and pick up you can do so using the space below that has been provided by Strike Lightning's GoGoCycles Used Motorcycles for Sale and PLEASE do not neglect to include your contact information in your email or to provide a phone number or email address so that I can respond with answers to your questions or set up an appointment as quickly as possible. In my opinion, there is not a more nicely appointed used Harley for sale as this one in Newton Wisconsin (WI), on Craigslist or in an Ebay auction so hurry and make an offer before this beauty gets away from you! 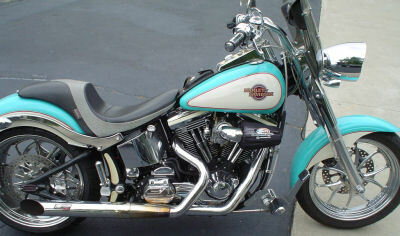 Strike Lightning would also encourage our biker friends to write a review of the 1997 Custom Harley Fatboy or share any thoughts and/or opinions to make potential buyers aware of any problems that are commonly associated with this fine motorcycle or to highlight its positive features and help our visitors make informed decisions. The price on this bike is only $9995 and at the first hint of warm weather it will most likely roll right out the door so email before it's gone and don't forget to mention that you found this ad on Strike Lightning's Motorcycle Classifieds www.gogocycles.com using the comments forms located on this page.